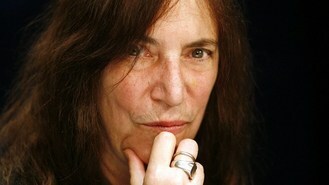 Rock musician and writer received the 2013 Katharine Hepburn Medal at a ceremony at the women's liberal arts school in suburban Philadelphia. Smith is recognised as a rock 'n' roll trailblazer whose work as a musician, writer, performer and visual artist influenced multiple generations. Her 1975 debut album, Horses, is considered one of rock's greatest albums and she received the 2010 National Book Award for non-fiction for her memoir, Just Kids. Smith said when the college approached her about receiving the award, "I enthusiastically accepted without hesitation." "Bryn Mawr is helping shape the futures of young women and providing them with the tools to be dominant forces in our society," Smith said. College President Dr. Jane McAuliffe said Smith "conveys enormous passion and continues to transform herself throughout her artistic journey." The college comprises 1,300 female undergraduates, two co-educational graduate schools and a co-educational pre-medical program. The medal named after Hepburn, a Bryn Mawr alumna, honours women who change their worlds and whose work and embodies the intelligence and independence of the four-time Oscar winner. It was awarded by the college's Katharine Houghton Hepburn Centre, which memorialises Hepburn and her mother, an early feminist activist who shares the same name, with programmes focusing on the arts and theatre, civic engagement, and women's health.